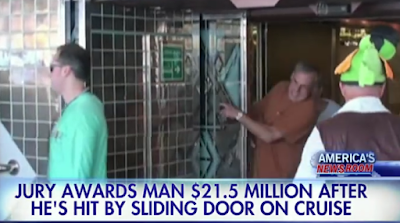 A jury has awarded a man $21.5 million in damages after he was hit by a sliding door on a cruise ship. The moment, captured on surveillance video shows a crowd of passengers heading out the automatic doors without incident right before James Hausman walks through. Hausman, 61, is struck by the door, and then is seen wincing in pain as he turns to his wife. He was later diagnosed with a concussion by a ship doctor, according to the Associated Press. Hausman’s lawyer told the court that tests showed his client suffered a minor brain injury, causing seizures and memory loss. Holland America, the cruise line operating the ship, has said it will appeal the ruling that came from a federal jury in Seattle on Tuesday. The settlement includes $16.5 million in punitive damages, decided after Hausman’s attorney produced evidence that showed dozens of other passengers had been injured in similar incidents triggered by dysfunctional sensors. “The verdict is one of the largest in recent memory out of federal court here,” wrote The Seattle Times.